The Green Phone Booth: I am woman, hear me...sew? Some days I feel like I've single handedly set the women's movement back 50 years or so. I get up and make the bed, get ready quickly, throw a load of laundry in, unload the dishwasher, feed the family, clean up the kitchen, get the kids clothed, pack lunches, get back packs ready, then load the kids in the mommy-mobile and head to school. Some days I volunteer in their classrooms, others I make a quick dash to the grocery store or post office. Unless, of course, there's a doctor or dentist appointment. Then I run home to do my part time job, while changing and folding loads of laundry in between tasks. I try to pick up the kids' rooms, put away clothes and toys, sweep, mop (I'll admit that rarely gets done), dust, clean bathrooms. All that just in time to go and pick up the kids from school again, come home and get dinner started. The evening is just as busy. The thing is...I'm not really complaining about it. Now, I was born in the 70's and raised in the 80's when women would damn well be whatever we pleased and our big shoulder pads would help us break through that infamous glass ceiling. I subscribed to that for a long time, feeling like I needed to move up the corporate ranks so as not to disappoint the women who had blazed the trail for my generation. In college I was enthralled by my women's studies courses and scoffed in the face of articles like The good wife's guide. I had it all figured out - life, work, the whole shebang. I had even earned a (lower) management position by the time I graduated college. For the next 10-ish years I worked hard, yet still wondered why I wasn't quite fulfilled in what I was doing. I kept wondering how and when I would figure out exactly what I wanted to be when I grew up. As we began to green and simplify our lives something changed. After years of wondering and worrying that I might not ever find my dream job, I realized that it wasn't a career at all that would fulfill me. It was living -- and enjoying -- a good life. I finally gave myself permission to do the things that I enjoyed. I began to fall back in love with crafting and sewing, creating things for my home, making gifts for family and friends. I started to cook and bake more and even learned how to preserve and can food. I adopted my great grandmother's motto of "Use it up, wear it out, make due, or do without." After two years of shopping less, living simply, and enjoying family, activities and nature more, we decided that I would quit my corporate job for a fun, part time job, that allows me to work from home and gives me enormous amounts of flexibility. You know, for mending clothes and helping preschoolers make playdough. And I do love doing those things. There, I've said it! I love not getting dressed up in uncomfortable clothes and rushing to an office each morning. I love being able to think about things like planning a vegetarian dinner or sewing new curtains. And a high five right back at ya! How lucky that you have found your peace and sanity at such a young age. It's all what you put our values on, isn't it? I was born in the 50's and felt somewhat of a failure when my generation of women were making waves in the feminist movement because I loved staying home to raise my children and be a "housewife". Re-entering the workforce in 90's doubled that anxiety because I was so far behind women younger than myself. Now I'm looking forward to going back to a healthier, happier lifestyle soon. THANK YOU! for a post well stated! And for all your good works! Rather than setting the women's movement back, I think your post is a great example of the impact the women's movement has had. You were able to try out several different lifestyles and see which one worked best for you. Letting women, and men, have options in their lives was/is the goal of the movement, not shuttling everyone into a new pre-defined box. Hurray to you for figuring out what made you happy! Fantastic post! This totally had me smiling, laughing out loud (the shoulder pads line was too funny!) and pumping my fist. I too worked in a large corporate environment for 8 years before having quits and opting to stay at home, develop a simpler, more frugal, greener and more meaningful lifestyle for me and my family. I've felt in the past like a failure to the women's movement, as well, but Steph has a great point. So too does a good friend who recently commented that our generation seems to be realizing what really matters. We are rediscovering the importance on family, relearning skills that skipped a generation, and embracing home making for the wonderful and lucky that it is. I don't know. I think you're a living, breathing example of a modern woman. Most women move between full time work, part time work, and staying home during the course of their lives. (The media would have us all believe that there's a war between SAHMs and working moms, but the truth is, most moms are both at different points in time.) That's in part due to the success of the women's movement, though work still needs to be done to create on-ramps for women. 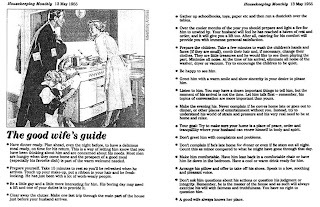 The fifties housewife would probably not have your level of corporate experience. She probably wouldn't have a part time job. If you ever are in a position where you decide you want to to work full time again, or you need to work full time again, you have the skill set to do so. And ultimately, that's why the feminist movement was important. It gives you the option to opt out of work and opt in, and to move back and forth through various changes in your life. What is great is in the past 10 years, I've seen the same flexibility given to men who used to not have the option to opt out. Now the idea of a stay at home dad is becoming more okay. Which is great. Women shouldn't be the only ones who get to opt in and opt out!! My husband and I laugh that in terms of $, we're equals. Well, actually I make a little bit more (and work fewer days) but whatever, we're equals. But at home, our roles are very gender-defined, and we're happy that way. I cook, garden, preserve, decorate... He splits wood, takes out the trash, builds things... and we'd never want to switch. I've always believed that I am in charge of my own happiness. My grandmother gave me that guide with a bridal shower gift. i always laugh because of her 3 granddaughters I'm the one she least had to encourage to be a housewife. While my husband is willing to help out around the house, I've set such a standard that it's better if he doesn't! I love my career and I do appreciate the few hours a week I set foot in the office and connect with other adults, but I have really gotten used to treasuring each little moment with my son (who coos on my lap as I type) What works for my little family is to let me have my 50s ideals and then tweak them to fit the day. I tried to make myself fit into the feminist ideals and I wasn't happy. Like Abbie says, I AM in charge of my own happiness! Wow, this was like reading an article about myself! In the end, I think feminism should be about choice. You chose to have the life that made you happy, and that's a good thing. You go, girl. What Ruchi and Steph said. 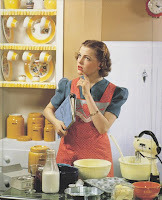 The point of feminism is that you aren't stuck with the housewifery if it doesn't suit you. The people setting back the movement are the ones saying "there is only one way to be a Good Woman and we're going to skew the system to punish women who don't comply"
Balance is tough to achieve. I think the big difference between our lives today and the Housewife's Guide is that we do what we do because it's right; right for us,right for family, right for the planet. Not because we want the Mythical Husband to approve. I too grew up in the heart of the ROAR era (except that my shoulders are naturally so broad that I had to cut the pads out of my clothes before I could ear them)...and the simple around-the-house stuff was boring and awful and something to be gotten over with as soon as possible. Because it was in that category of work labelled NECESSARY BUT NOT IMPORTANT, if that makes sense. Work of the women-slaves-of-yore, therefore not to be valued. We had moved beyond it. 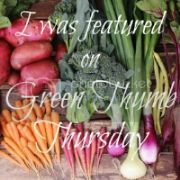 I think what's primarily different now from the fifties may be that, in seeing what Convenience Consumerism has done to our lives and our planet, we are beginning to realize that this work of greenness and simplicity, of knowing how to feed and clothe our families responsibly and well, really IS important. We don't (at least I don't, and it sounds like y'all don't either!) do it so that we can fit the mold of a Good Wife or a Good Mother, we do it because it is an important part of being a contributing member of today's world. Ruchi's comment is well-taken, too--this isn't necessarily "women's work" we do, it's the work of the household. I happen to cook better than my husband, and I get excited about variety and recipes and stuff, so that's my turf. I'm also better at keeping the day to day clutter at a managable level. But when it comes to serious disinfecting deep cleaning, he (no pun intended) could wipe the floor with me. So that's his turf. He also vacuums, does most of the laundry, and takes care of the non-garden parts of the yard. I do the garden, the cooking, the de-cluttering, and most of the kid-schlepping. We share the dishes. I spent a year as a SAHM, he spent a year as a SAHD, and we've worked it out. I'm not sure I agree that it's all about choice per se; I think it's about the dawning realization that the work of the Home is so incredibly vital and valuable that we can embrace it without giving up our hard-won societal position standing right there with the men. Welcome to Third Wave Feminism. You are not setting us back, you are moving forward. Loved this post. I'm thankful that I can work outside my home, and even more thankful that I only have to work about 10 hours/week and the rest of the time my work is as a wife & mommy. I had an 8-5 job during the summers when I was in college and it didn't take many summers for me to realize that I was miserable being away from home that much. Even before I got married, I figured out a way to be self-employed so I wouldn't have to do that. The beauty of where women are now is that as much as possible, we have a choice. Loved this post! I can totally relate. I have always loved cooking, but never used to mention it to people. After focusing for years on my career, I realized that, really, what I love to do is cooking and crafting and creating (the same stuff I did as a kid to play! ), and that I'm no longer embarrassed to embrace it! This post really struck a cord with me. My experience is very similar -- born in the '70s, growing up in the '80s, convinced that I did NOT want to be the housekeeping kind of woman my grandmothers were. Then life happened and I find I'm happiest, living simply, spending time with my family, tending to the garden, trying to lessen my impact on the planet. It's nice to know there are others out there who feel the same way. Thanks! Well high fives all around. I'm so glad to hear that I'm not the only one. Although I did have a hunch! ;) Maybe we can copy the Slow Food Movement and start a Slow Women's Movement. Huh, might need a better name for it though. Jenn, that's a really good point. I guess I don't think feminism is all and only about choice, though you could read my comment that way. (Teach me to comment in a rush while I'm on my way to something else!) Thanks for an insightful comment. We just became followers of your blog. Nice work! I am SO glad you posted this! I have long been thinking about how in a way, women who return to the home, who are capable of cooking, cleaning, sewing, caring for the home, gardening, etc...are almost the ultimate feminists because they have capability, and therefore, a sense of independence. That is feminism in practice... The ability for us to choose how we want to live our lives and feel supported and appreciated for those paths.